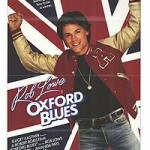 Oxford Blues is the story of Nick Di Angelo, played by Rob Lowe. Nick has a major thing for Lady Victoria Wingate and is working in a Las Vegas casino to earn enough money to pursue her to Oxford. Nick believes he can win her over if he gets a place at Oxford University and join their rowing team. Nick spends the night with a wealthy older woman while working at the casino and she gives him enough money to get to Oxford. When he arrives he meets another American in Rona, played by Ally Sheedy. It isn’t long before Nick finds Lady Victoria but she is already involved with the star of the rowing team, Colin Gilchrist Fisher. Nick and Colin soon build up a fierce rivalry that only gets stronger until the climax of the film. 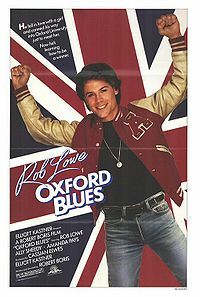 Oxford Blues was never going to win any Oscars but it’s a fun movie and would hold special interest for anyone that’s attended Oxford University or likes rowing! Nick Di Angelo – The lead character played by Rob Lowe. Nick is trying to get into Oxford University to chase the woman of his dreams Lady Victoria Wingate. Rona – Another American at Oxford, Ally Sheedy character becomes friends with Nick but she wants more. Lady Victoria Wingate – The object of Nick’s affection, she does her best to resist his advances. Colin Gilchrist Fisher – Played by Julian Sands who you may recognise if you are a 24 fan. Colin is the star of the rowing team and takes an instant dislike to Nick. Geordie Nevitts – Nick’s trusty room mate and friend. Lady Victoria’s character was loosely based on Princess Stephanie of Monaco. Star Cary Elwes’ brother, Cassian Elwes, served as Producer on this film.